It’s dark, way too early, and my heart is thumping; after 10 minutes on winding dirt roads, our driver stops in a field that’s filled with hot air balloons—each one marked with different colors and company names. He parks in front of a ruby-hued blimp and tells us to disembark. Cold and nervous, I’m tempted to ask if I can stay buckled up inside the van, where it’s warm and seems safe. But then I remember that I’m in Turkey—and you only live once—so I say a little prayer, then jump out of the vehicle and into the balloon basket. In what seems perfectly plucked from a whimsical fairy tale, the sun and balloon rise in perfect harmony—honeycombed hills below, rosé sky above. Despite six others on the ride, it’s completely silent, which only seems appropriate as we’re suspended in the air witnessing Mother Nature’s landscape at her finest. Touching down in Turkey, my expectations were a blank slate. 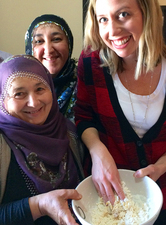 What I quickly discovered is the vast land—slightly larger than Texas, with Mediterranean and Middle Eastern neighbors—boasts a history as rich as baklava and a vibrant patchwork of people (some of the kindest you’ll ever meet), places and culture, with a cuisine that’ll leave you hungry for more. Ambling along Istanbul’s cobblestone, cat-filled streets you’ll find mosques mingled amidst churches and ancient ruins nuzzled next to modern high rises, resulting in a juxtaposition of old and new that draws wanderers immediately in. Spanning two continents—Europe and Asia—and sited along the Bosphorus, Turkey’s largest city is home to roughly 18 million and has plenty of sights—and hammams (bath houses)—to soak in. 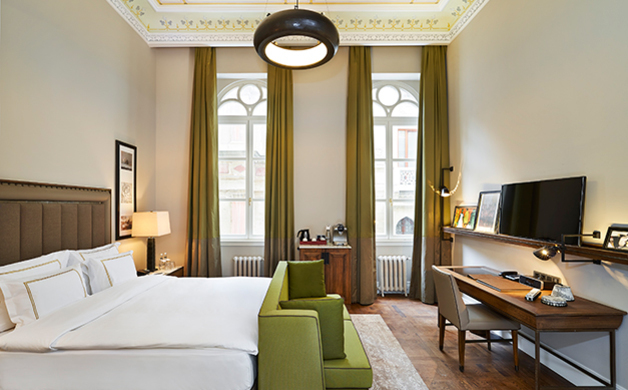 1 / You’ll feel right at home the moment you enter Vault Karaköy, The House Hotel. Blending classic and contemporary features, the boutique property—housed within an old bank whose original vault still exists in the hotel’s wine cellar—is located in one of Istanbul’s hippest hoods, with easy access via foot to popular tourist destinations such as Galata Tower, the Spice Market, Istikal Street and the Bosphorus waterfront. 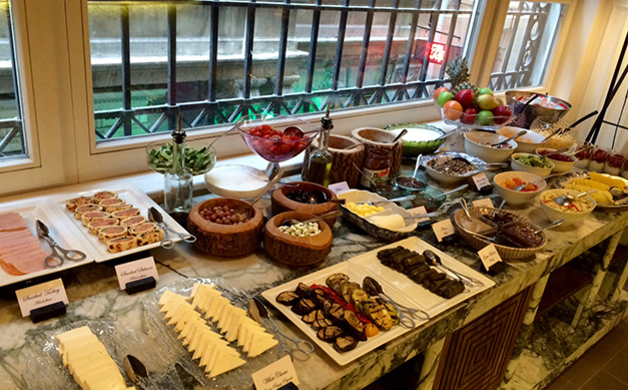 2 / The Turks take their morning meal seriously, and Vault Karaköy’s doesn’t disappoint. Rise and shine with an impressive spread of fresh-squeezed juices (my favorite was the ever-present pomegranate), dolmas, roasted eggplant, just-picked tomatoes, cheeses, olives, heavenly slabs of honeycomb, pastries, figs, sucuk (a dry, spicy sausage), yogurt, jams, made-to-order egg dishes and the menu goes on…truly giving guests a taste of what Turkish breakfast is all about. Fun fact: Although Turkish coffee (which comes in six varieties of sweetness) is widely consumed, locals typically start their day with tea and wait until after breakfast before imbibing in a jolt of java. 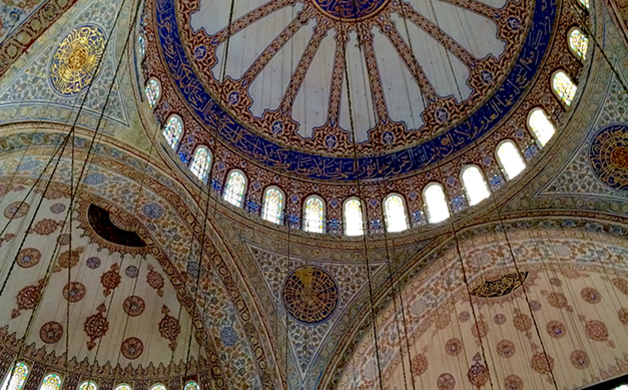 3 / It’s impossible not to be stirred when setting foot on the Hippodrome (rectangular arena and site of chariot races during Byzantine times), stepping inside the aptly named Blue Mosque (boasting an azul-tiled interior and curvaceous exterior with cascading domes and six slender minarets) and Hagia Sophia (a cathedral-turned-mosque-turned-museum that dates back to 537 AD), wandering through Topkapi Palace (one of the major residences of the Ottoman sultans between the 15th and 19th centuries) and exploring the enormous expanse of labyrinthine alleys at the Grand Bazaar (one of the largest and oldest covered markets in the world). A personal tour guide guarantees you won’t get lost and are shown around by someone with a wealth of knowledge and genuine passion for the place they live; what’s more, they always know the best “local” spots to dine and can help when haggling at the bazaar. Just 90 minutes by plane from Istanbul, you’ll be swept into what feels like an extraterrestrial planet—a place whose lunar landscape is dotted with “fairy chimneys” (rock formations created by volcanic eruptions) and serpentine valleys with undulating cliffs in a rainbow of colors. 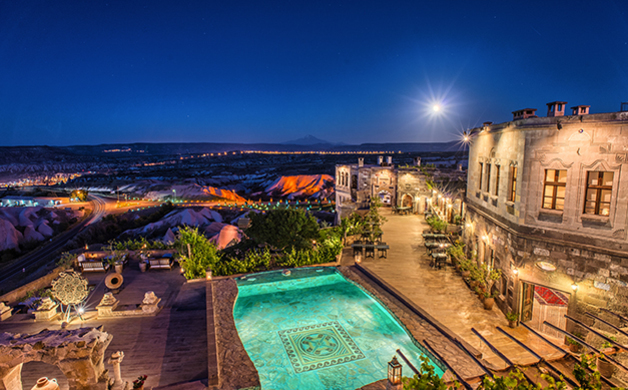 Welcome to Cappadocia, where luxury boutique inns are built into ancient cave dwellings (we recommend the Museum Hotel, featuring in-room wine taps, supernatural views and service fit for a sultan), subterranean cities—where up to 10,000 Christians hid from hostile forces—can still be explored today, and plenty of outdoor adventures await. 4 / If there’s one activity that should immediately soar to the top of your bucket list, let it be a sunrise hot air balloon ride. Climbing over craggy canyons, cone-shaped configurations and pink mountains in a flame-fueled balloon basket, as the sun awakens and creeps higher and higher above the horizon, you’ll literally be floating on cloud nine. 5 / Despite the region’s barren-looking land, the soil is richly fertile, thus yielding the cream of the crop when it comes to produce, meat and dairy. And there’s no better way to experience true Turkish cuisine than by taking a cookery class with Cappadocia Home Cooking. Upon entering the traditional stone dwelling of Tolga, Tutba and Havva, you’ll be welcomed with open arms—and plenty to eat. As Grandma guides you through a bevy of traditional dishes, she allows you to chop, sauté, stir and more—all the while making you feel like family. NOTE: The above journey—including all hotels and excursions—was tailor-made by award-winning tour operator Audley Travel. Featuring family recipes from husband-and-wife co-owners, Ertugrul and Tugce Hazar, with spices sourced from a market in Istanbul, you’re guaranteed authenticity the moment you step inside the colorful surrounds and take your seat at Rocklin’s Anatolian Table.